progVisions is a progressive rock e-zine, published in English and made by an international group of members. Search in the progVisions database ... and find your review. progVisions login for administrators to get access to the admin pages. progVisions is a progressive rock e-zine, published in English and made by an international group of members. Our objective is to become a centre of information that contributes to the knowledge, growth and development of progressive rock. Cast is a Mexican Prog band that was founded in the year 1978. The band is also famous for organizing their own Baja Prog festival in Mexicali. The output of the band is immense. So far the band has released 18 studio albums, 2 live albums and a Blu-Ray DVD. Of course there were several changes in the lineup but the heart of the band, keyboardist / composer Alfonso Vidales is still controlling the Cast vessel. The band is on the verge of releasing a new CD entitled “Power And Outcome”. Because I did my last Cast review in the year 2003 (“Al-bandaluz”) it is about time to bring the band to the attention of our readers again. At the time I was impressed by the double album “Al-bandaluz” and wrote that it was in my opinion the best Cast album so far. After this the band released the studio albums “Nimbus”, “Mosaique”, “Com.Union”, “Orginallis”, “Art”, “Arsis” and “Vida”. At the time of “Arsis” there was a complete new lineup. After listening to the albums “Arsis” and “Vida” I think that this lineup is probably the best lineup that the band ever had. Just watch the YouTube teaser trailer of the Blu-Ray “Sands of Time” on the band's website (www.castoffical.com) and you know what I mean! 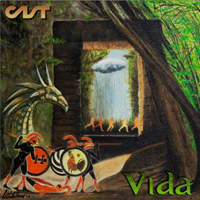 Before the new album “Power and Outcome” will be released we will have a look at the predecessor “Vida”. The album opens with the delicious track “Dragon's Attack”. One of the first things you will notice is that the band has now a violinist. His name is Roberto Izzo. The violin is a welcome extension of the sound pallet of the band. As I mentioned before this is a great lineup. The music has still that South American temperament but there is more room for melody. Great uptempo opener with passionate sung vocals by singer Bobby Vidales and nice guitar and violin parts on a bed of keyboards. And this is only the beginning. On the second, fourth and fifth track the musical pallet of the band is even more expanded. You can enjoy the classical input of the GNU quartet with beautiful instruments like cello, flute, violin and viola. The second track “Silent War” opens with a melodic violin and guitar parts and delicate sung vocals. In the vocal department Bobby is joined by Lupita Acuna who is responsible for some vocal harmonies. The keyboard orchestrations and violin parts are great on this album. Halfway the track the band goes full throttle and the track becomes more uptempo. The intensity of the music is building up to a great climax. The track “Change” is one of the highlights of this album. You can find beautiful vocal melodies and amazing guitar solo's by maestro Claudio Cordero in this track. And the melody of the violin solo is pure bliss. Composer and keyboard maestro Alfonso Vidales is shining on this album. Then it is time for the longest track of the album entitled “Run In The Rain”. One of the many highlights of this remarkable album. The real strings and the harpsichord sound of the keyboards are giving the piece a classical atmosphere. The vocal melodies are very beautiful. In this beautiful composition the band is slowing down a bit. This gives the album the needed diversity. The GNU quartet is also playing on the following track “House By The Forest”. The combination of the sometimes hectic symphonic rock and the classical input of the quartet is working very well. In this piece you can find some great flute parts. Because of the flute parts the music reminds me sometimes of the Hungarian band Solaris and the Dutch band Focus. The album closes with a 18 minutes long suite “Door To The World” which is divided into the parts “Through The Door”, “Fight For Life” and “In My Dreams”. The first part has an hectic uptempo opening with great drumming of Antonio Bringas and beautiful melodic violin parts. “Fight For Life” is an instrumental piece in which the band is on fire. In this piece you can hear that the band Cast consists out of a bunch of highly skilled musicians. The closing section “In My Dream”s has a slow and melodic opening with delicate sung vocals. The melodies are wonderful in this piece. The song develops into one of my favorites with beautiful vocal lines and melodic synth and violin parts. Maybe I am repeating myself here but I truly believe that this “Vida” Album is the best album that the band has made so far and that the band has a killer lineup at this moment. The combination of the sometimes hectic and overwhelming Symphonic Rock and the real string instruments of the GNU Quartet which gives the music a more classical touch is an enrichment to the bands sound pallet. That counts also for violin of Roberto Izzo. Bandleader, keyboardist and composer Alfonso Vidales has surprised me once again with a remarkable album full of beautiful melodies and temperamental South American Prog. Highly recommend by progVisions. Looking forward to hear the new album “Power And Outcome” ... the story of Cast continues. In this corner you will find some CD's at the recommendation of Douwe Fledderus. Copyright © 2000-2011 progVisions - All rights reserved. Graphic Design & Webdesign - Copyright © 2011 Blissy Design - All rights reserved.